I’m just gonna be straight ignat (ignorant) with this post. This book right here… this book RIGHT HERE! Listen, A&J put some stank on it, you hear me? Do not read this novel if you haven’t started with book one, The Cartel. Trust, none of this will make sense if you aren’t caught up in this series. Let me break this down without spilling the story: So, if you have read book 5, then you know Miamor started some ish. Because of Mia’s actions, the family faces yet another war. The Diamonds are used to wars, but this time, there’s much more at stake, much more to lose. Bonds will be broken and betrayal is at every turn. We readers will see that diamonds truly aren’t forever. Who will be left standing in the end? Yes y’all, it is that serious. Although I thought books 4 and 5 were decent, I think A&J came with it this time. They are letting us HAVE IT! I’ve already told you this book is on 10 the entire time, as this book goes very fast. Read slow or you might miss a few things. Now, I must admit, there were times where I was like, seriously? We are really doing that? Some parts seemed a bit unrealistic or easily put together (you get what I’m saying? ), but hang in there. It all comes together in the end. I know I say this on every Cartel post, but I miss Mecca. It just isn’t the same without him. It would be interesting to see how the three brothers would have handled it all together. This book is fast-paced, gritty, raw, just all out hood ish. It’s street lit at its best. But you all know this by now, right? A&J came through with their dope storytelling. Although the cartel will never be the same, there is the opportunity for new beginnings. With that said, bring on book 7 please! Ashley and JaQuavis, please don’t keep me waiting! Good job y’all! The Diamond men, yesss honey. Alright Cartel and A&J fans, do yourself a favor and get this book when it is released in July. 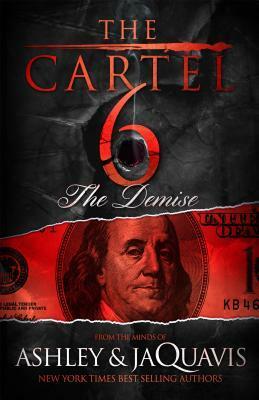 Again, if you haven’t read book one, The Cartel, please do so before jumping into this one. Book 6 is not a stand alone novel. Actually, none of them are in this series. So start with book one if you haven’t. Edited to add: I just reread The Cartel 1 and the timeline of Zyir and Carter’s relationship is off in book 6. Does that interfere with the story? Hell no! I’m the person who notices those things, can’t help it.